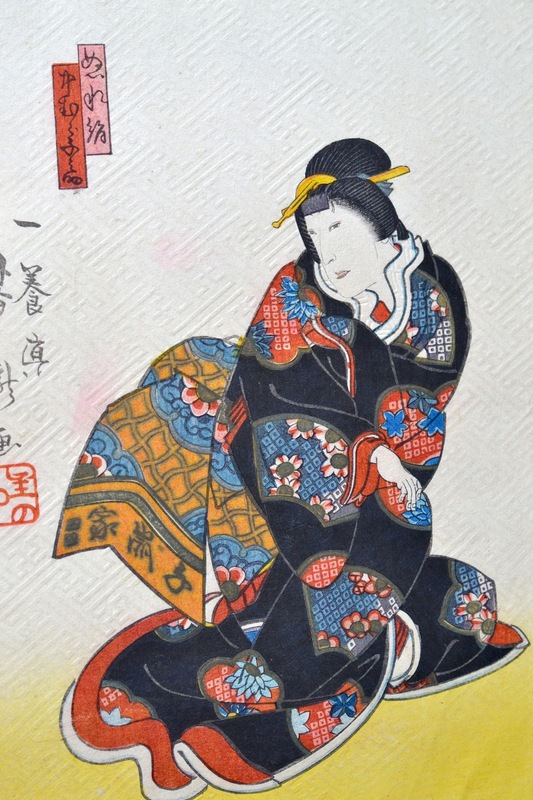 Utagawa Yoshitaki (ca 1841 - 1899) Three Actors in the Play, Honcho Nijushiko, 1860’s. Deluxe Chuban Triptych. This stunning deluxe triptych portrays Arashi Rikan as Yaegaki Hime (right), Arashi Rikaku as Takeda Katsuyori (centre), and Nakamura Jusaburo as Nureginu (left) in the kabuki drama Honcho Nijushiko. This jewel-like triptych has all the qualities that make Osaka prints so desirable: the deeply embossed all over pattern in the background, the extravagant use of expensive strong pigments, the sophisticated print techniques and a dramatic, beguiling sense of design and proportion. The plot involves a 16th century feud between two rival clans. The Shogun Ashikaga Yoshiteru has recently been murdered, and the heads of these two noble families have been ordered by the shogun's widow to find the murderer or forfeit the heads of their heirs, Takeda Katsuyori and Nagao Kagekatsu. Princess Yaegaki, is betrothed to Katsuyori but only knows him through a portrait. Before they can get married, Katsuyori supposedly commits suicide. The real suicide victim, however, is the husband of Yaegaki's maid Nureginu. In this scene Yaegaki Hime and her maid Nureginu are grieving over the death of their lovers when the gardener Minosaku (really Takeda Katsuyori in disguise) appears. Yaegaki falls in love with the disguised Katsuyori (her former betrothed) and asks Nureginu to be her go-between. Katsuyori asks Yaegaki for a sacred helmet originally belonging to Takeda Shingen as a token of her love. Katsuyori continues impersonating Minosaku and Yaegaki takes Katsuyori's sword and tries to kill herself, saying she is too ashamed of what she did to get the love of somebody who is not her betrothed. Moved by Yaegaki's faithful love, Katsuyori tells her the truth. A really fine print with deluxe printing, the entire background is deeply embossed with an interlace design. The figures are embellished with lacquered shomenzuri designs, metallics and mica encrusted decoration. Colour and impression are very fine, some surface marks but otherwise very good condition.